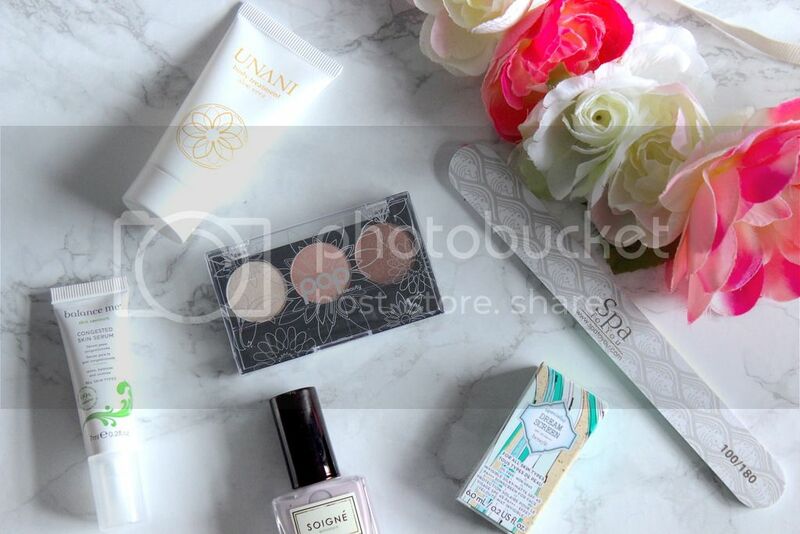 I'm really quite excited by this months birchbox, so I'm jumping straight into it. At first I was surprised by the no box thing but once I realised it was a handy purse for holiday essentials, well I was instantly in love. Although were not looking at going on holiday until later in the year, I'm glad I've got something like this to already start keeping hold of my passport and other little pieces. I'm also in love with all the products so let's get talking about those!? POP beauty: peach parfait eyeshadow trio | £15.50 Now this was the first product that caught my eye, ha, get it?! I'm literally OBSESSED with eyeshadows lately and this is just so extremely handy. Eyeshadows have become a staple piece to my makeup routine and I'm in love with creating smokey eyes. So this little pocket sized trio will work perfectly for me. Just everything about this little product just gets me excited even the palette size and well the design on the palette too...and can I say once again how in love with the colours I am. SOIGNE: lavande | £11 This is a close second to the products which excited me. Firstly, I don't ow a colour like this and Secondly, well I haven't worn polish in forever now so it'll be nice to get some colour back onto my nails. I've not used the SOIGNE brand before so I'm looking forward to seeing how well this works. *SIDE NOTE* I popped this on my nails yesterday morning, the colour is AWESOME, it dried so quickly and one coat was enough for the colour, eppp I've found a new nail polish favourite. spa to you: Nail file | £2.99 Just a little extra into this months box but I love that the nail file was included. I'm almost like Birchbox knew my nails needed the TLC...Though there isn't much else to say about a nail file is there? benefit cosmetics: dream screen | £25 If you know me and my blog well, you may be aware that my high end makeup collection is limited, while the collection is growing I can't always afford the products so I'm happy when I see sample sizes of these brands in my birchbox...though little design flaw here, I know samples are to test things out before purchasing but as this is sunscreen theres not much of the product to test before you buy? That being said, the little box and bottle are cute, the sunscreen has almost no smell and overall I'm just not too amazed by this considering! balance me: congested skin serum | £16 When it comes to new skin care products I'm never too excited at first. However when I tried this it got me all giddy. This handy little bottle is to help treat spots and break outs, not that I have them much but when I do it irritates me so finding something which I can use just on my spots, just fills me with a little bit of happiness. This also smells just like Lush WHOOSH shower jelly & well that just adds to the happiness. unani: aloe vera gel | £15 I'm glad to see this body treatment in my box this month, however I just feel as though I won't be using this as much as I'd hope. This is described as a product to use after spending time in the sun, almost an aftersun product. So I'm not saying I won't use it but I've not had much time in the sun lately and I fear this will be the same for the rest of summer! Though we're going on a family holiday to cornwall in August, maybe it'll be a good chance to test it out then! And there you have it, July's Birchbox. It feels like only last week I started this subscription and I'm onto my third month already. I'm happy with how this box/bag turned out, I've been given so many great products, and all which are perfectly sized and handy for me to take on my travels or just to pop in my everyday use handbag...so theres no complains here! These products look lovely! 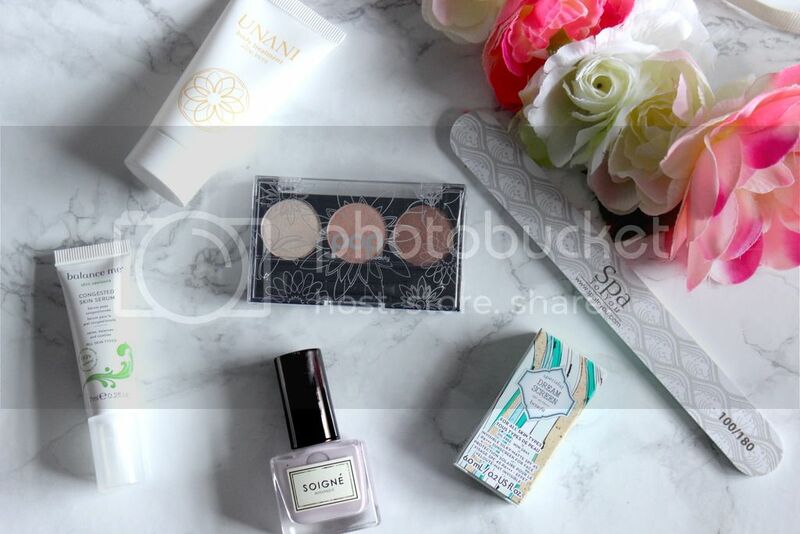 I can't decide if it's worth getting a beauty gift box; would you say it's worth the money? That nail varnish really does look so nice too! Love the little BirchBags they're sending the products out in, fantastic for travelling and storage! Huge fan of Benefits skincare range here, I'd love to try their Dream Screen, I love their eye-potent and moisturiser! I loved mine, although I do wish I had that polish in my one! The polish looks like a nice colour! I love this month's concept with the bag as opposed to the box - so handy for holidays! I love the look of the nail varnish and the eye shadow trio! That is perfect for travel!